SnowSphere speaks to Paul Wilson of Propaganda Snowboards about the trials and tribulations of being pioneering Brits in the ski resort of Jasna, Slovakia - setting up the first ever ski lodge to cater for the UK snowboard and ski market. What exactly do Propaganda Snowboards do? Originally the whole Propaganda ethos was that we would be building up a brand to eventually, once we saved up the funds, to start getting our own kit out there: a full range of hard and soft goods, clothing etc. We set up the lodge in Jasna, Slovakia with the intention of having a base in the mountains to work from. Why did you choose to set up in Slovakia? We’ve been riding ourselves in this part of Europe for a while and we know how amazingly cheap the place is in terms of food and drink etc. We just got fed up with paying 5 euros a beer and having to sell our livers to eat on the hill. In Jasna its still around 75p a pint and £2 a meal on the hills, so it just made sense. On top of that there is some amazing terrain over here. Slovakia itself is a beautiful country and has all year round activities. In the summer we go climbing, mountain biking and white water rafting all within walking distance of our front door, and about 5km away there is every other summer thing you could wish for. Do you speak the local lingo, and do they speak much English? To say Slovakian is a tough language is an understatement, but to their credit everyone pretty much speaks English where you need them to. Until the fall of communism in the late 80s, German and Russian were the only languages taught in schools, since then, English is the number one choice generally. My Slovak is getting better. It seems I am most fluent after a few beers! How popular is snowboarding in Slovakia? It’s huge, there is a massive local riders’ ‘scene’ but it goes further then that. You have people from all over central Europe heading here as it’s some of the best terrain around. A local Slovak guy won silver at the Olympics, so they know what the score is. A lot of Brits seem to think Slovakia is stuck in the past, but it’s not like that at all. You sometimes hear that Eastern Europe can be a little “dodgy”. Got any good stories for us? Not really to be fair – it’s like anywhere, you head to a bad area you may get trouble. I have felt more intimidated in a village pub in England then anywhere over here. Slovakia, in my experience, is a much safer, friendlier place then most of the places I have ever been to. What obstacles did you face when trying to set up your business in Slovakia? This country relies entirely on paperwork. Everything you do is filling out forms – all in Slovak of course – and then taking that form to the next office to get a stamp to go to the next office to get another stamp – its crazy. It was a long slog and at times we just felt like giving up – but its all good now. What are Propaganda’s long term goals? We all want to work and spend our time doing what we love, making equipment and shredding on it. The lodge this season for us has been superb too, every week there was another group of people enjoying the area and amazed at what’s on offer , so we’d like to keep offering this for as long as we can. I’d also like to start checking out some of the other countries around this area that offer great ski and snowboarding terrain that are overlooked. Slovenia is next on the list, Ukraine and even Russia after that. Who knows, as long as there is hills and snow, we’ll try to ride it. We hear that the big tour operators will soon be selling Slovakian package tours. How will this effect Propaganda? Not much I don’t think to be honest. Perhaps it will benefit us with the area’s increased popularity. We have actually played a part in helping a couple of the big names research Jasna and the surrounding ski areas, as we think it can only be a good thing. Also, we offer something that none of the tour operators, no matter who they are, can offer. We have a team of guys here that have so much experience on and around the mountain. We also have the added ‘hands on’ benefit; it’s our home at the end of the day and that experience goes much further than a part time tour guide just out on the piss for a season. 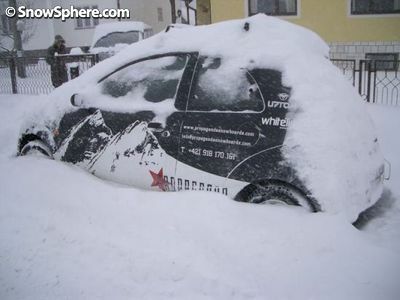 It seems that Eastern Europe is quickly becoming a hot spot with skiing and snowboarding Brits. What makes Slovakia different from snowboarding in Slovenia , Poland, Romania etc? Slovenia is a great place to go riding and has a good set-up, but at the same, time prices are already way higher then over here. Maybe because of its location next to affluent Italy and Austria, who knows. As far as Poland and Romania go – the only thing you have to say is that Jasna, where we are, is the number one location for Polish ski holidays, and the area is far more developed then both Romania and Poland combined. There’s good ski infrastructure in place in Slovakia and lots of investment going on both in the ski resorts and in the country in general, so it’s pretty exciting here right now. What are the downsides to being ski business pioneers in Slovakia? Pioneers sounds all very exciting! Things were hard to begin with and took their toll on us all here. At the time we got here, there were no other ski operators at all. The internet was like a ghost town for information on the ski resorts, just one or two mentions on Google about the area, so we came over and had to start from scratch, ie check every ski resort, check every town, work out the hard way how things worked out for the best. We had to sacrifice a lot at the same time. Leaving friends and family behind to turn up in a strange country where we really didn’t know anyone, and try to turn it into home in a matter of months. Three years down the line and things are very different. We are different as people – I was only 22 when we set this up and didn’t really know where I would end up, but now, happy as larry. Are you based in Slovakia year round? Yeah all the time. In summer we go rafting, mountain biking and all the things you would expect to do in the summer in the mountains. mbsk.co.uk is one of the summer things we do – the biking tracks in Jasna are fantastic. What’s the snowboarding in Jasna like, and what’s the standard of snowboarding like among the local Slovakian population? There’s a good local scene and a pretty high standard of snowboarding. The actual riding area looks limited if you look at the lifts, but spend 10 minutes hiking and you get into the “freeride” zones – you could spend your whole life time ripping up these areas and you have them all to yourself as no other tourists generally venture to them. A good mix of slopes also makes for a varied trip. Although if you are gunning it you could probably do all the slopes in a day, there is so much more on offer. 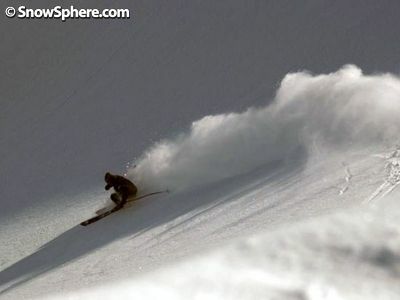 For me, the best tree runs I have ever hit are in Jasna. What’s the history, idea, and ethic behind Propaganda? 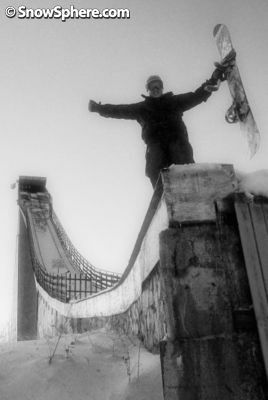 I could come up with all these clichés about us being a “riders for riders” type of brand – to be honest that’s just the done thing these days – you don’t get into it if you aren’t interested in snowboarding. We’re just a group of guys that set out to try and follow the ‘Dream’ as it were; we knew there was life beyond the 9-5 office. Propaganda as a name came from Paul back at Uni, did some project back there where he made a snowboard film, and the name just fell into place. Setting up your own snow business is an inspiring achievement. What advice would you give other people who are wanting to set up their own snow projects? If it’s a good idea it will work. If it’s something new it will work – but it HAS to be something different and you have to be willing to give up eating the good stuff and drinking with your mates 24/7 – it will bleed your finances dry in the early days but stick with it. There are so many opportunities out there, and so many ways in which you can “live your dream”. Like SnowSphere shows you, there are so many countries in the world that you can ski and snowboard in – so why not head somewhere new and start afresh? Is Slovakia a cheap place to go skiing and snow boarding? In terms of the cost of living, such as food and drink, it is for sure. We’ve just been accepted into the Euro so from Jan 1st, a pint will be 1€, a 3 course meal about 8€ and so on. You can still find yourself a nice property or ski apartment reasonably cheaply, but I think the house buying super bargains are gone. Funnily enough, snowboard kit is more expensive here than other countries. What kind of reception did you get from the locals when you set up Propaganda? To begin with people were slightly unsure of us. I’m not sure if they really got us to begin with. However, once we started working with a few of the big companies over here who are in the snow business, people started recognising us and are pretty good to us now. We’re just known as the Propaganda guys - which is pretty funny! What’s the worst thing about running your own snowboarding company? I’ll have to get back to you on that one; maybe it’s the bit where you actually have to get out of your gravis trainers when you go for meetings with the banks or something. What’s the best thing about living in the mountains? Do you really need to ask?!! All year round there are “adrenalin” activities and if it wasn’t for the fact that I’m on crutches I’d be out there right now and not talking to you guys! You sometimes hear that some countries in Eastern Europe suffer from bad food, old lifts and long queues. Is there any truth in this with regards to ski resorts in Slovakia? Bad food? No that’s just not the case. It’s different from what you are used to at home – in a way it lacks variety – we are spoilt in Britain, we have an Indian, Chinese, Mexican, Italian restaurant on every high street – here, the nearest Indian is a 4 hour train ride away. However, local food is hearty - meals that stick to your ribs and get you through the long winters. Strangely, a lot of people actually laugh at The British food culture here…. And finally - are you ‘living the dream’? I’m living my life where I want to be, doing what I want to do...if that’s living the dream, then I guess I am close. I would be a fool to complain about things or what we’ve got out here, but I think when you are so committed and working towards getting something to be a success, that by the time it gets to this level, you need to look onto the next project to keep you driven. I’m only 26, I still need to look forward to the next chapter, Propaganda will always have a place here in Slovakia, but where’s next? Who knows - as long as we keep enjoying it that’s all that counts. That gold plated helicopter parked up in Alaska isn’t going to pay for itself!